New Castle, 1704-1777. Dover, since 1777. December 7, 1787, 1st State. Area: Delaware Geography, 2,489 square miles. 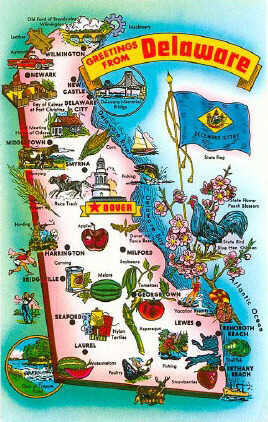 Delaware is bordered on the east by the Atlantic Ocean. 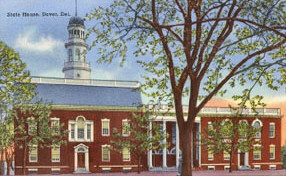 Constitution: Delaware Constitution,1st state to enter the Union. Manufacturing: Chemicals are Delaware's primary manufacture product (drugs, industrial chemicals, plastics and other synthetics). The food processing industry (gelatin, pudding, other prepared desserts, canneries, poultry, baked goods, fish products, soft drinks) ranks second followed by automobile production..
Services: The finance, insurance and real estate industry contributes more to the gross state product than any other industry. Growth in the finance and insurance sectors fuel growth in real estate. Community, business and personal services (private health care, law firms, hotels, car rental agencies) rank second followed by the wholesale (automobiles, food products, commercial equipment and supplies) and retail (discount stores, grocery stores, restaurants) trade industry. Mining: Delaware ranks last of all the states in mineral production. Magnesium is the primary mineral product followed by sand and gravel. Highest Point: West of Ebright Road, 450 feet above sea level in a mobile home park just west of Ebright Road. Ebright Road is in northern Delaware near the Pennsylvania border..
Natural Resources: The natural resources of Delaware include fertile soil and mineral deposits (clay, sand and gravel, Brandywine blue granite).